Would you fancy keeping your lawn neat, clean, and trimmed, with a tool stronger than a reel mower but without the heft, fumes, and gas-mixing of a z-turn? For people with the green thumb, an electric lawn mower might just be the most attractive option! You might think, “Where do I even start? What kind of electric mower should I get? How big? What features should it have?” It’s about these concerns that I felt the need to alleviate many of the worries and considerations that people might have with electric lawn mowers. 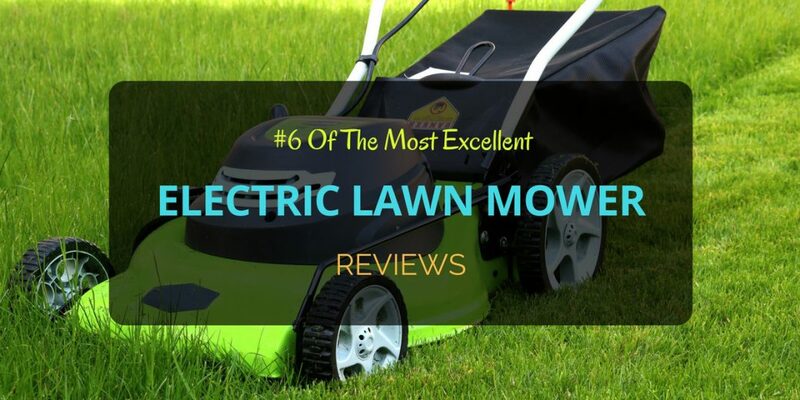 Therefore, in this article, I’ve listed six of the most excellent lawn mower reviews for every kind of gardener eager to have a manicured lawn. With these eco-friendly options, you’ll do your lawn, your neighbors, and mother earth all a favor. Also, we’ll get to see the factors that you should inspect before getting your mower! In this handy buyer’s guide, I’ve outlined the important features and traits of electric mowers for which you should be on the lookout. The first thing you need to decide on with electric mowers is their power source. You can get a corded model, which runs on the mains via an electrical cord, or you can get a cordless option that runs on batteries. Below, I’ve outlined the strengths and weaknesses of both types of electric mowers. The overall weight of the mower will always be a significant factor to consider. This element will determine how easy, or difficult; it will be to handle the mower especially if you have a large property. Although strength levels may differ, it would be wise to choose a mower size that is appropriate for your lawn maintenance needs. A factor that is closely linked to a mower’s weight would be its cutting width or the size of its cutting deck. Electric mowers can generally range from a cutting width of 12-inches up to 20-inches. Again, you will be able to balance cost, efficiency, and mower size if you choose the mower with the cutting width ideal for your needs. Another important aspect when choosing your next mower is the unit’s variable blade or cutting height. Naturally, different types of grass, as well as personal preference, will dictate different heights for cut grass. Often, you’ll see mowers sports features that control how high or how low you’ll cut the grass. Also, this feature may include the number of increments between the mower’s highest and lowest cut setting. Finally, you may also consider how the mower will handle the resulting grass clippings. Mowers may have different, mulching, and bagging options as well as discharge capabilities. Although mowers with a side or rear discharge both have their own advantages and disadvantages, it most usually boils down to personal preference. However, you may need to consider the size of the grass catcher that comes with your mower. Starting off our electric lawn mower reviews is the corded Sun Joe MJ491E running at 12A. Weighing in at 29 pounds, the MJ491E is markedly lighter than most of the mower’s on our list yet its hard-top easily withstands heavy-duty use. Its 14-inch cutting deck may mean that this mower is more suited for small to medium-sized lawns. However, it’s 3-position adjustable cutting blades will let you mow grass from over an inch to around two and a half inches. Additionally, its detachable 10.6-gallon grass catcher will mean an easy and convenient disposal system of those grass clippings. Despite sharing a similar 12-amp electric motor with the Sun Joe MJ491E, the 25022 from Greenworks is decidedly more powerful and can handle grass up to 5 inches and medium to large lawns around half an acre, provided of course that you have the extension cords to match your property’s size. Furthermore, I loved the seven possible height adjustments in the Greenworks 25022. This nifty feature will make sure you get the perfect cut for your lawn. At 56 pounds, this electric mower is certainly not as light as those under the 20-inch cutting deck category. However, the 25022 is still the lightest option at this cutting deck size. Furthermore, the mower’s large wheels alleviate any heft that the body may carry. In addition to all these features, the Greenworks 25022 is also incredibly quiet when in use. At a cutting width of 12inches, the Black+Decker MTE912 is surely one of the most compact mowers on our list, and will more likely be best for small lawns and gardens. However, its selling point is not necessarily in size. When you get the MTE912, you’re actually getting three essential garden tools all at once! Technically, the MTE912 is a 6.5-amp string trimmer at heart, but Black+Decker has designed it in such a way that it will also serve as a mower as well as an edger! The MTE912 utilizes a standard 0.065-inch trimmer line via a single-fed string system, which makes It readily available and very easy to replace. Additionally, this mower-trimmer-edger hybrid features an Automatic Feed System (AFS), which in trimmer-speak only means it ensure that the string is always at the right length for cutting. When you need to use the MTE912 as a trimmer or edger, simply detach the wheelbase and your ready to go! The first battery-powered mower on our list is the 40-volt GreenWorks 25322 G-Max that comes in at 37.5 pounds. Then, with a cutting width of 16-inches, the G-Max will serve most average-sized gardens while controlling grass heights of up to 3.4 inches. What I found fantastic about the G-Max, however, was its potential 3-hour run time! The 25322 from GreenWorks accomplishes this task via the two pre-included batteries. The 2AH battery can run up to an hour, while the larger 4AH battery can go for two more hours. These traits make the G-Max remarkably efficient especially for large properties or even sports fields. Lastly, I also found the rear bagging and mulching attachment on the 25322 very convenient during use. May be difficult to push for those who are used to self-propelled mowers. One of the most powerful, durable, and innovative mower on this list, if not the most aesthetically-pleasing is the Ego Power+ (LM2001). You’ll undoubtedly stand out with this machine on your lawn. The Ego Power+ features a 20-inch cutting deck with super mulching, side discharge, and rear bagging options. With its 600W high-torque motor, the Power+ will be able to cut more grass in markedly less time. Then, a 56-volt, 4.0Ah battery powers all the features above, keeping the mower running for around 45-minutes. However, it’ll only take a quick half hour to recharge the battery fully. Lastly, the only reason as to why I didn’t give the EGO Power+ full marks is probably due to its weight, which is at a hefty 65 pounds. Our final option of the six best electric lawn mower reviews is in the Black+Decker CM2040with its 20-inch cutting width and 6-setting variable height adjustment. Like the Ego Power+, the CM2040 features mulching, bagging, as well as side discharge capabilities. What’s interesting though, about this Black+Decker mower is its Variable Speed Motor. This feature automatically senses the thickness of the grass and makes power adjustments accordingly. Therefore, when you push the mower into the dense turf, it will increase cutting power. On the other hand, when the mower senses lighter grass, the engine will automatically decrease power. Overall, the Variable Speed Motor feature ensures that you conserve as much battery life as possible and effectively extending its runtime.